View today's 8 W Monroe Chicago Loop condos for sale and the best Chicago real estate listings below. Metropolis is a condo building in Chicago, Illinois that offers a wide range of amenities to fit any lifestyle. Find the newest 8 W Monroe condos for sale & real estate property listings in 8 W Monroe below! Browse our Chicago condos, lofts, Chicago penthouses and Chicago highrise condos for sale by location, size or price and let this website be your local real estate guide. We would love to be your Chicago real estate agents and assist in the condo buying process. For more information about 8 W Monroe properties for sale or to schedule a private condo showing, contact your Chicago Loop real estate experts today. Read more about 8 W Monroe real estate. Plan to make a condo purchase or sell a condo at 8 W Monroe? Call 312-810-6693 to reach Guarnero Group Compass now! Our community of 8 W Monroe real estate agents and agents will help you navigate the Chicago Loop condominium market. 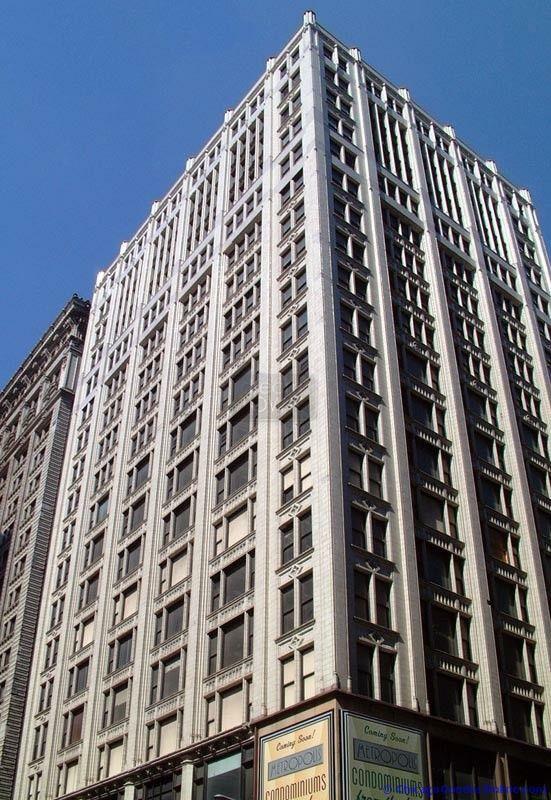 Located at 8 W Monroe and formerly known as the North American Building, Metropolis condominiums are found in the heart of Chicago's Loop neighborhood. While the 21-story structure that houses the Metropolis was originally constructed in 1913, this vintage beauty has since been renovated in 2006 by Warman Development and Design for a cost of $28,000,000. This extraordinary building is brimming with fine details and superior craftsmanship as exemplified by its terra cotta detail and classic brick construction. The all-new design and interiors of the luxury condos at the Metropolis have transformed what was once a 20th century office building into contemporary living at its finest. There are 169 separate luxury condos at 8 W Monroe and a variety of floor plans to choose from. The condos display many desirable features including 12' ceilings, an in-unit washer and dryer, ample closet space and laminate hardwood floors. Breathtaking lake and cityscape views are enjoyed from the units' many windows. Kitchens are decked out with granite counter tops and a black appliance package. Building amenities at The Metropolis include a state-of-the-art fitness center, a sprawling sundeck that boasts spectacular city, lake and park views, a large party room and a 24-hour doorman. Also, animal-lovers will be happy to know that The Metropolis is a pet-friendly building. Located in the heart of Chicago's central business district at the corner of State and Monroe, The Metropolis offers its residents a supremely convenient location. Michigan Avenue's famous shopping is just minutes north while plenty of department stores and boutiques also line State Street. Millennium and Grant parks are less than two minutes away so taking advantage of the multitude of concerts, festivals and variety of events they play host to over the summer months couldn't be simpler. The Art Institute is less than ten minutes south of The Metropolis, while other cultural venues like the Lyric Opera, Goodman Theater and Symphony Center are just a stone's throw away. Numerous public transportation options surround The Metropolis, but considering its prime location, residents won't need to draw upon any of them for their work commute. Rather, The Metropolis is a true walk-to-work building. Buying or selling a condo in 8 W Monroe? Let our team of Chicago Loop real estate agents help you through the purchase of your new 8 W Monroe property or the sale of your current 8 W Monroe condo. As local Metropolis real estate agents and real estate agents, we have expert insider knowledge of the market dynamics unique to the Chicago IL real estate market. We're here to work with you today! Contact Guarnero Group Compass to get more information about buyer or seller representation in 8 W Monroe. Planning to get involved in the Chicago Loop real estate market? Review our CMA (comparative market analysis) form to quickly see your Metropolis property evaluation within minutes.